So Mercedes look to have pulled a great ruse with their performance in Australia, Bottas looks like a new man who dominated (admittedly exaggerated by LH's floor damage) and Ferrari both looked bemused by both their Quali and Race pace and have made Vettel the clear number one by stopping LeClerc's charge late in the race. However as we have learnt over the years (or for some of us decades) Albert Park often gives a false picture of both the competitive picture and overtaking potential so will Bahrain show a similar picture? 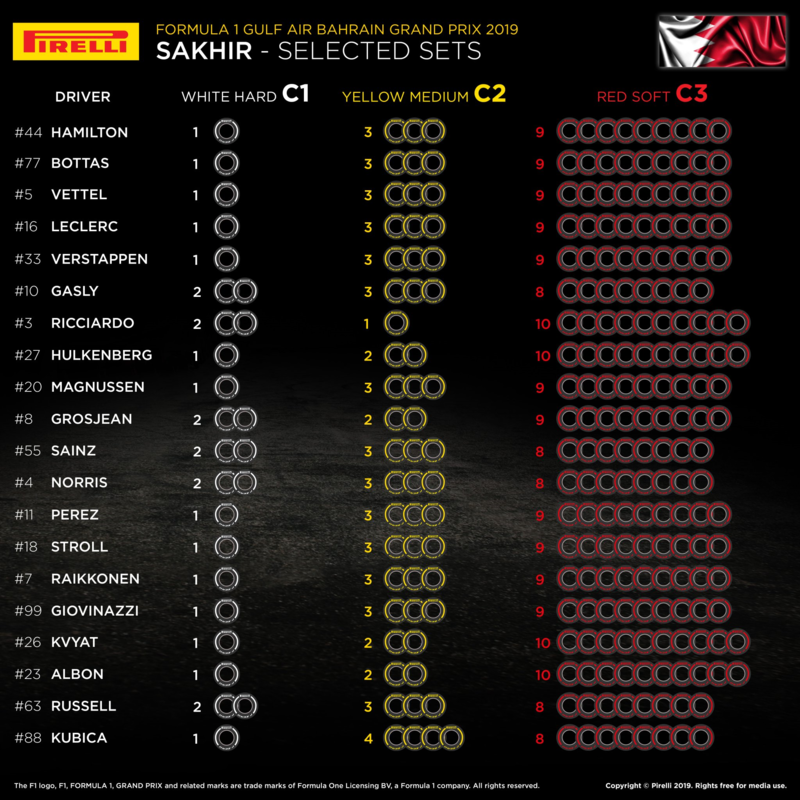 My thoughts are that Ferrari will make a big step as it is clear they failed to optimise their set up from day 1 in Melbourne and combined with Sakhir being a much more conventional downforce circuit. They will be at least on par with Merc if not marginally ahead but not the big margin seen in Barca pre season. I feel the jury is still out on Bottas he had a great race probably his best in F1 but Lewis' damage makes it look much more dominant than it really was and before we can consider him a realistic WDC contender we need to see if he has improved his consistency. RB Honda looked good and I feel Verstappen will contend more strongly on pace than he did last year especially as Newey has as per always produced the strongest Chassis, however while it is clear Honda have made good progress I still believe they will have enough reliability issues (2 or 3 failures will probably be enough) to stop Max contending for the WDC even if he can Win races. Edited by thequadge, 18 March 2019 - 16:29.
now, I was born 9 weeks premature (I know, I know, minor miracle, etc ... ) but in forum terms... build-up threads 2 weeks before a GP? Pur-lease! The bold bit... is a pretty bold statement - pun intended. The Ferrari was dreadful in Melbourne in slow/medium-speed corners and under heavy breaking, which is what Bahrain is mostly made up of. On top of that it's a rear limited track - so if they had issues keeping their rears in shape, then they will suffer relative to RB and Merc. And I haven't gone into the alleged PU issues that some have been reporting... (4 long straights in Bahrain). They better hope that their car just wasn't set up properly for a bumpy track or else Bahrain could be just as bad if not worse for them. I used to find racing here boring to watch but the last few grand prix have been really exciting. Great race track, looks super under the lights too. Good atmosphere about it, and it'll be great to see a more truer representation of the cars. I have strangely always been excited for the Bahrain GP the last 5-ish years, I quite like the layout and the racing has improved massively. If we can get another 2014, or even closer racing, I'll be overjoyed! Saw this thread and thought for a minute it was this weekend. Got me scared there Quadge. It is 2 weeks until Bahrain people! We just came off a 16 week offseason! 2 weeks is nothing. Edited by thequadge, 18 March 2019 - 17:01. Well, it will be more of the same. Mercedes for the win goes without saying, but all eyes will be on Ferrari from the starts of practice because if they do have PU problems like the rumours are saying, then we this year's battle will only be between Bottas and Hamilton. That said, I'm also interested to see how the mid-fields teams develop. I guess it's too early to say the pecking order but I'd really like Renault to improve a bit and will be interesting to see if McLaren can improve too. Aside from Ferrari drama, I know Hamilton will win the championship, Bottas is not Rosberg and I would really be surprised if there was even a hint of a tiff in the Mercedes camp (from confirmed sources, not the media who probably are already saying there's tension in the garage after Australia), so that's about it. Since it became a night race Bahrain turned into the 2nd best track for overtaking on the calendar (besides Shanghai) even. Hard to predict things though. In previous seasons Ferrari looked a lot better here than in Melbourne, while that is encouraging on the one hand the fact that slow corners and straight line speed was lacking in Melbourne could bite them here badly. But if Melbourne was just a bad set-up they'll be right in the business here. And both drivers are good on this track. Got a sneaky suspicion that Red Bull could do well. Honda with Toro Rosso got a great result last year. Mercedes will have to confirm whether their Melbourne form was a fluke or not. I do generally expect things to be different than in Melbourne, if it isnt it becomes increasingly likely that they will be very hard to beat to the title. This is one of the very few tracks where Bottas was competitive in both of the last two years against Hamilton (at least over one lap), A repeat could give him the perfect start. Back to where Bottas' got his first pole two years ago and beat Hamilton over the weekend last year too. Looking forward to it with this newfound optimism. Agreed and its always such a borefest....as cool place as Melbourne is, that track serves no purpose in F1 anymore (if it ever has). Im perfectly fine if F1 season starts in Australia in future as well, but they need new, proper race track there. Edited by Balnazzard, 18 March 2019 - 19:13. Australia has the luxury that's the first race of the season, which means that fans will always be interested in the new cars. Put it in the middle of the calendar and a lot more people would complain about how boring the circuit is (rightly so). Of course, Bahrain has been the opening race a couple of times, and the general opinion was that it shouldn't have been. Because it's a boring Tilkedrome in the middle of nowhere. Yet it has produced some very good races. You'll be hard pressed to find as good a lead battle as the 2014 edition in most 21st century Grands Prix. I think the track itself was not an issue, the negative voices were mostly criticizing hosting the opening round in a place with no heritage, no fanbase, no atmosphere. It's good for racing so it's acceptable for "just another race", but the priorities are a bit different for the first race of the season. It should be something special from an "event" point of view, which is what we do have in Melbourne. Edited by Anja, 18 March 2019 - 20:36. We can only dream that that might be true. The track is average. C- or so. I don't get why these guys with so much money to spend didn't go for something unique and ambitious. There is nothing outstanding about it even though it was built with as little constraints as possible. No memorable corner. No memorable sector. Nothing unique. No character. Silverstone has been destroyed and rebuilt for decades trying to fit in all sorts of advancements, but it remains fast and challenging. It still has character. Same for Spa and Monza. In Bahrian they had a blank check and clean slate and that was the best they could do. Meh. Classic Tilke stuff, if you ask me. I think its probably a more difficult task than we all imagine. Especially in what is pretty much a desert. You cant build culture from scratch in the middle of nowhere. I think they should use the perimeter circuit. It would be a high speed desert blast. Don't think it has shown a false picture in most years. Mercedes won 3 out of the last 5 Australian GP's and only reason they didn't win in 2018 was a tactical blunder. Bahrain is actually very similar in terms of track characteristic to Melbourne, both are stop-and-go tracks with predominantely slow corners, where traction and braking stability is important. The main difference is that Bahrain has longer straights, so engine and aero efficiency will come more at play. This doesn't bode well for Ferrari considering how slow they were on the straights already in Melbourne. Edited by Celloman, 18 March 2019 - 22:23. Last year there were 86 overtakes in Bahrain on cars that were the most difficult to overtake with in recent years. They should exceed 100 easily this year at least if tire differences come into play. Give me a long straight every day of the week instead of Monaco 2.0 in Melbourne. Pirelli are bringing the C1, C2 and C3 compounds, which are technically a step harder than last year, but the C1 and C2 compounds are slightly softer year-on-year. Should still be a comfortable one stop, though. The weather looks peculiarly mild, too. Bahrain has produces really nice & entertainment races in the past few years. I'm looking forward for this race, for the spectacle but also trying to look for more answers for the ugliness from Australia (for Ferrari). Really looking forward to this race. Should give us a much better estimation of where the teams are at. Don't think it has shown a false picture in most years. Mercedes won 3 out of the last 5 Australian GP's and only reason they didn't win in 2018 was a tactical blunder. 2017 was also a bit of a strategy screw-up by Mercedes, not helped by a tyre-hungry Hamilton. It was understandable why they did what they did at the time, but it probably wouldn't be how they'd do it a second time. Ferrari did well to pressure Mercedes into stumbling. Melbourne may be dull, it's not wildly different from the rest of the season - and to the extent that it is, it would probably be no different in any other first race where teams are still getting used to their new car in Grand Prix conditions. Edited by Nonesuch, 19 March 2019 - 11:34. I know it's a crap track for a lot of reasons but for some reason I do love seeing F1 cars on it. Maybe because it's the first race I ever saw on t.v. and I have a bit of rose tinted glasses, but I do find it a nice looking track and scenery. Reminds me a bit of monza. Weather experts are telling me it will be a dry race. I’ve always remembered the Bahrain night races to approach 28-30degC ambient temps. But the forecast this year puts ambient temps more towards 22-23degC, which seems unseasonably mild. Inevitably will help with cooling and tyres, and we should also see some quick, quick lap-times. Just a little bizarre.
. Nothing unique. No character. Thread is a bit early but annoyingly there is no B2B races till June I think? Yes, French-Austria GP combo, but you can watch Indycar to ease the pain. Can someone explain how they use 10 sets of softs in GP weekend. Lets say 3 sets for Q, and 2 sets for each FP, 1 extra for race? Did I just read correctly that there's no consecutive race weekends until June?! Madness, how am I supposed to avoid family get togethers and social life?! Good job I have Indycar and FE to fill the gaps. Phew. Ridiculus - should have gone for the C4 and ditched the C2 in Bahrain. How are we expected to see strategic variety? They will likely use 1 set of medium in FP2 (or rather Renault will use 1 hard on one driver and 1 medium on the other) to practice long runs. That would make it 11, so naturally you have to sacrifice one of the qualifying runs. If you dont get into Q3 you even have a spare set for the race. Edited by Marklar, 20 March 2019 - 08:04. My prediction is a Ferrari 1-2 in the quali with Mercs close behind. As for the race, dunno. But I bet it is going to be very entertaining! I'd agree Albert Park has always been less exciting than Adelaide was. Sakhir looks rather boring and like any other Tilke-Drome. What is specifically disappointing is that Herr Tilke said that it's desert location meant starting with a totally clean sheet...that he could build gradient into the track and make something unique and exciting.....he then proceeded to transplant the Hungaroring and the slow parts of Spa into the desert. But having said all that, it does tend to produce good racing. Not necessarily battles for the lead but good racing for points. I've always enjoyed Sakhir on the F1 games, and find it looks actually pretty gorgeous in the night setting with the lights, palm trees and paintings around the track. It's delivered some good races in the last 5 years I think, especially the 2014 team-mate battle bonanza. We had Maldonado helping Gutierez do a somersault, Perez's and Lewis's dodgy defending, Max's oscillating foot, Lewis's 3-in-1 overtake, SPARKS, some good sweeping corners at the end of sector 2... political unrest, riots, I think looking back there's actually been a lot more to this race than many think. I don't approve of Bahrain or it's leaders, but the race itself I like. I think it's nice to have a desert climate for a GP, something different, a USP. Shame there aren't many desert countries not run by dodgy rich folk. Bahrain is the best possible track to hope for Ferrari to hit back hard. Vettel kind of owns the place and set up there should be totally straightforward. I can see a Ferrai 1-2 coming from far. How people can expect anything else baffles me after last race..
Man, Ferrari were saving fuel like crazy, they could't use the engine due to overheating and the car had no grip.